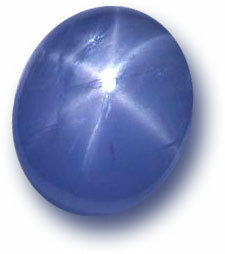 English: Star sapphire cabochon displaying six-ray asterism. Français : Saphir étoilé, taillé en cabochon pour mettre en evidence son astérisme. Permission for public use of this image in perpetuity is given by me, Mitchell Gore, the owner of this image. This work has been released into the public domain by its author, Lestatdelc at the Wikipedia project. This applies worldwide. Lestatdelc grants anyone the right to use this work for any purpose, without any conditions, unless such conditions are required by law.